With pumpkins being in season I have been roasting them to make and freeze pumpkin puree for use later. By the end of the day my place was pretty hot from having the the oven on so much. While I was thinking about how warm my place was I remembered seeing this recipe for a pumpkin pie milkshake on Our Best Bites that sounded like the perfect way to beet the heat and enjoy some of the freshly pureed pumpkin. With the pumpkin puree, pumpkin pie spices and the brown sugar, this drink is pretty much just a pumpkin pie in milkshake form. There is even a graham cracker garnish to remind you of the pies crust. For the most part I left the original recipe as it was though, I did replace the vanilla ice cream with frozen vanilla yogurt and I garnished the milkshake with crumbled gingersnaps rather than graham crackers. This milkshake was literally as easy to make as throwing the ingredients together and blending. You can easily control the consistency of the shake by changing the amount of milk that you use. If you like a really thick shake, only use just enough milk that the ice cream or frozen yogurt will puree in the bender. If you like a thinner shake then you just need to add some more milk. The pumpkin pie milkshake was so good! It was nice and thick and the pumpkin pie flavours came through really well. It was a great seasonal treat and it was nice and refreshing after having the oven on all day long. I know that I will be enjoying a few more of these shakes while I still have some pumpkin puree on hand! Blend everything other than the gingersnap cookies in a blender. Serve garnished with the gingersnap cookies. Oh my! it looks really good! Nice!! I'd like a glass of this. with a scoop of ice cream on top. When you freeze the pumpkin puree, do you just thaw it later and reuse for a recipe? I was just debating whether to eat my way through the excess pumpkin or throwing it away, not even realizing that I could freeze it and use later. oooow… can't wait to try this. thanks for posting it. Did you put that milkshake in a stemless wine glass? It looks like it. How very fancy of you. That looks delicious. Wow, this shake sounds good. It'll go with the pumpkin pie! very wintery coctail! Sweet and spice! Tahnks for idea for a healthy treat. How cool! Literally! What a delicious milkshake idea. Perfect! I always have weird leftover amounts of pumpkin puree around this time of the year. Linda – one scoop at a time: Yep, it's as easy as freezing, thawing and using it in a recipe. You know. I generally think that you can't possibly outdo yourself. But then you go and take all your food to some higher plane. I love this. I think I could eat it every day for the rest of my life. What a gorgeous creation! That milkshake must be so delicious! That looks delicious! I wanna run to the store now so I can make it! You are really making the most out of pumpkin season. Why aren't I??? I don't know which pumpkins are for cooking. I think Whole Foods has some smaller ones and I'll ask this morning. I don't think you're suppose to use the big jack o lantern pumpkins are you? 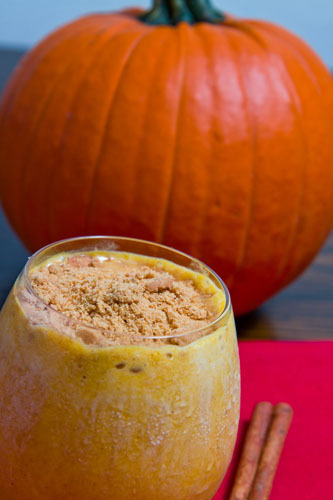 this looks and sounds delicious… love pumpkin! now this is amazing Kevin!! you are so creative. Yum! Sounds good Kevin. I have still not experienced pumpkin in anything but savoury dishes. I really must make the effort. What do you think I should start with Kevin? Awesome shake, those are great fall flavors! Just another reason to love this time of year! What better excuse to have a pumpkin pie milkshake? This looks exquisite! It's still really warm here in LA, so this is a nice way to get the pumpkin flavor of the season in a cold treat. I should just set up automatic updates for every recipe on your blog because they're all amazing!! Will definitely be making this! No you didn't just make this shake!! Kevin yo are killing me, this looks so awesome. Forget McDonald's stupid green shakes for St. Pats, they need to make your Pumkin Pie Shake for Fall. Awesome! Lea Ann: Around here the pumpkins are usually labeled as pie pumpkins (the smaller ones) or carving pumpkins (the larger ones). I have always gotten the smaller 'pie' pumpkins for cooking. I've posted your link on my blog. This is such a great idea! Thanks for sharing it with us. Wow what a combo! Never heard of anything like this before. Great to see such interesting things being done with pumpkin. One of the Autumn things I look forward to is Pumpkin Ice Cream or Pumpkin Frozen Custard at my local ice cream shoppe. But this is one I could whip up at home quite easily. A great idea Kevin. And so funny on Friday, I roasted butternut squash, then pumpkin and then amber cup squash, delicata and even spaghetti squash. My oven kept going all day long. That's a recipe to keep for sure Kevin. Love those pumpkin recipes. that's really different! love it! I've seen a lot of baking recipes that use pumpkin, but I haven't seen a shake yet! This looks delicious! Love your take on it Kevin! Isn't it yummy?? Man, I've been making way too many of these lately! It has been so hot here still…that milkshake would be perfect for the season!!! Looks awesome! Fantastic – perfect for cold winter days. I combined this with Alton Brown's Eggnog recipe (that has a little bourbon) and it is simply splendid – the pumpkin adds so much to a simple eggnog. Thanks for all you do Kevin! You are my Hero! This is all Ill ever need to eat for the rest of my life! Best food blog on the net. Yum! Can hardly wait to try this! Can not wait to give this a try!! !